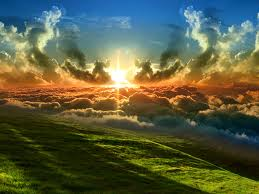 In the previous post we was looking at the New Jerusalem as the new creation which took the place of the old Jerusalem. We looked at the time frame, God’s progressive work in history and a bit superficial of the Bride and its character. because as we saw in the previous section, these verses contain an overview of the the current sinful order. When we go in and look closely at the Bride, we also see these character of an sinful order still exists in the world, but outside the city (the bride). The main message I want to show here is that the new creation in John presents in the Revelation is in the business today. We can take a couple of verses early in Chapter 21 before we go in and look at the New Jerusalem from verse 9. From there we will go progressively forward with the verses I see is important, until Revelation. 22:15. In Revelation 21:6 speaks Jesus to John about salvation and the living water that was promised without payment. We see that John also draws here from Isaiah (Isaiah 55:1). “He who believes in me, as the Scripture has said, from within him will flow rivers of living water. “39 But he said this about the Spirit, which those believing in him were to receive. For the Holy Spirit was not yet given, because Jesus wasn ‘t yet glorified.” (John. 7:38-39). Clearly we see that this is in the present, and not just in the future. We are now going to look at some truths about salvation and the character John describes of the bride / church acting on the earth today. Revelation. 21:14 says that city is built upon a foundation of 12 stones (Rev. 21:14). This is the church, which Paul presents as already “built upon the apostles and prophets foundation” (Eph. 2:20; cf. Mat. 16:18; 1 Cor. 3:10). That John uses this image again here in Revelation is to unite it with the victory in year 70 AD, which is the final confirmation of Christianity when it finally divorced from Israel and Judaism. Revelation 21:19-21. These stones can we see more clearly in verses 19-21. There we see really how valuable the church is in the eyes of God, which is “adorned with all manner of precious stones.” The Christian meets gospel works that glorify the name of God and exercise faith that reflects her value to God. “that the proof of your faith, which is more precious than gold that perishes even though it is tested by fire, may be found to result in praise, glory, and honor at the revelation of Jesus Christ–” (1. Pet. 1:7). The stability of the church is emphasized by Jesus when He established the church. “So then you are no longer strangers and foreigners, but you are fellow citizens with the saints, and of the household of God, being built on the foundation of the apostles and prophets, Christ Jesus himself being the chief cornerstone; 21 in whom the whole building, fitted together, grows into a holy temple in the Lord; in whom you also are built together for a habitation of God in the Spirit.” (Ef. 2:19-22). The “New Jerusalem” placed on a map with Patmos in center. All the known churches is located in this area. In Revelation. 21:16 John is been shown “the great city, the Holy Jerusalem” (Rev. 21:10), which is the Bride (Rev 21:2). This city is measured to be 12 000 stages (approx. 2.250 km) squared. This is interesting. 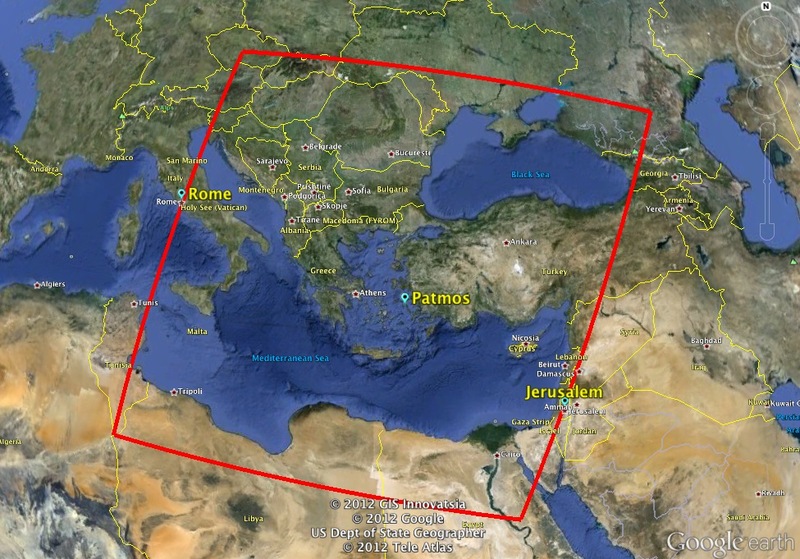 If you draw up this square on a map of the Mediterranean, with Patmos where John wrote the Revelation as the center, you will see the west side of the square reaching to Rome and the eastern reaches to Jerusalem. Northern and southern edge extending substantially to the northern and southern boundaries of the Roman Empire in the first century. All the Christian community that existed at that time (60-90 AD), will you find located within these boundaries. Revelation 21:16 also shows church influence. In Isaiah. 2:2-4 we read that she “shall be exalted above the mountains” and “All nations shall flow unto it.” Another prophet says that she is “a nice shot” and be planted “on a high and towering mountains” where “All kinds of birds will live.” (Ezekiel 17:22-23). Now, because of Her prophetic promises, the Lord has put her to “make disciples of all nations”. This church will not go around judging others, “For God sent not his Son into the world to condemn the world, but that the world might be saved through Him.” (John 3:17). Revelation. 21:22 John wrotes that he “saw no temple in it, for the Lord God Almighty and the Lamb are its temple.” Perfect fit this into Christ and death, the temple is been unnecessary (Mark 15:38; Joh. 4:21; Acts. 17:24; Heb. 8:13). Jesus is the temple (John 2:19-21, Eph. 2:19-20), for He says: “Here’s one that is greater than the temple.” (Matt. 12:6). Two things happen at his death, the chief priests sharing his robe (Matt. 26:65) and the temple veil torn (Matthew 27:51), which is a sign of the upcoming removal of the Temple system and the opening of the sanctuary for the faithful (Heb. 10:19-22). “For so has the Lord commanded us, saying, ‘I have set you as a light for the Gentiles, That you should bring salvation to the uttermost parts of the earth.’ “ (Act. 13:47) (Read also Matt. 5:14-16; 2.Cor. 6:14 og Eph. 5:8-9). This prophecy from Isaiah 42:6, which Paul and Barnabas refers to is regarding Jesus, who is the light (John 8:12, 9:5), but He also establishes His church to be the “light of the world” (Matt. 5:14) and it “already shines” (John 2:8 cf. Rom. 13:12). Revelation 21:25 saying that “Its gates will never be closed.” This is so that the converts will enter it. The ongoing evangelization brings in more and more, and had the gates been closed, would not any “new” entered. Then we could say that this was the final absolute terms, but as we see it is not. Revelation 21:27 suggests a “pre-judgment” setting, where sinners still exist, for it says that “the unclean and he who practices abominations and lying” does not have any access to the New Jerusalem. The unconverted are impure, as we can see in Scripture image of the Gentiles outside of Christ (such as Peter’s vision of the sheet filled with unclean animals, Acts. 10:14-15, 28; 15:19 cf. 2 Cor. 6:17). “By the river on the bank of it, on this side and on that side, shall grow every tree for food, whose leaf shall not wither, neither shall the fruit of it fail: it shall bring forth new fruit every month, because the waters of it issue out of the sanctuary; and the fruit of it shall be for food, and the leaf of it for healing.” (Ezk. 47:12). Revelation 22:15 shows us that “dogs and sorcerers and fornicators and murderers and idolaters, and whoever loves and practices a lie” still exist and are outside the city. These are probably the goal of evangelization then, at conversion, access to the healing leaves from the tree of life and the water of life. Scripture is amazing. Although Revelation that can be so hard is been fabulous colorful once one gets the clear idea of ​​what happens. All sew neatly together into a big beautiful blanket. Scripture teaches that Christ enters the new covenant blessings. When Jesus came, He came to heal (1 Pet. 2:24) and to set the oppressed people in freedom (Lk 4:18, Jn. 8:34-36; Acts. 26:18, Rom. 6:6, 18, ​​22, Gal. 5:1) and from the curse (Rom 5:21; 7:24-25, Gal. 3:10-13). He continues with this today through His church as we have seen, and this church describes John as wonderful in Revelation 21 – 22. Bible verses are taken from the WEB (World English Bible).